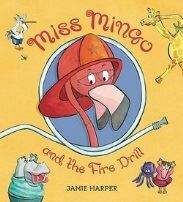 Ms. Mingo and the Fire Drill has been written for 5-7 year old children featuring a large diverse group of often silly animals expressing their initial fear and disorganization of fire safety, fire drills, and fire fighters. Under Ms. Mingos’ guidance the animals work together to master all the fire safety lessons. Although this book is for 5-7 year olds it can be made interesting for older kids as well. Side notes of how each animal deals with fear were interesting to the audience of children up to 11 years old. Prior to performing a fire drill at the YMCA day cares, I posted a flamingo, complete with a fire hat, at each school to spike interest. After performing the surprise drill the teacher gathered the 3 year olds and older to listen to the story. Ms Mingo, minus her metal legs, accompanied me in my arms as I read. Older kids laughed with how animals conveyed fears by sounds, movements or (always a favorite) stink. Bringing in a smoke detector helped them relate to what a fire drill at home would sound like and was introduced after reading the book. A firefighter also joined us to show how all the gear looks on and how firefighters sound when on air. To encourage the children to discuss what they learned with their parents, an at home fire drill plan was sent home at the end of the day. Any children who returned their finished plan received a firefighter tattoo. Ms. Mingo and the Fire Drill is an enjoyable book and definitely one to keep for your collection.